The U.S. Department of Energy’s (DOE) Oak Ridge Reservation is an economic engine for the state of Tennessee, according to a report released by the East Tennessee Economic Council (ETEC). The report studied the effects of DOE’s investment in Tennessee in fiscal year 2017. This report details the scope and scale of DOE’s impact on Tennessee’s economy. It examined job creation, state GDP growth, private-sector procurements, payroll and pension disbursement, state and local tax contributions, and community development conferred on the state by DOE, as well as the ripple effects of this spending. DOE’s economic impact on the state of Tennessee equals $5.6 billion. Tennessee’s gross domestic product increased by approximately $3.4 billion as a result of overall spending by DOE and its contractors. Additionally, $2.2 billion in total personal income was generated by DOE–related activities in the state. 12,618 jobs were directly created by DOE and its contractors in Tennessee. An additional 21,878 jobs were generated by the indirect effects of DOE investment. For every one job created by DOE and its contractors, an additional 1.7 jobs were created across the state. The private sector supports DOE’s missions in Oak Ridge. Of the approximately $1.1 billion in non-payroll spending from DOE and its contractors, more than $943 million went to Tennessee businesses for the procurement of raw materials, services, and supplies. A portion of these tax dollars enable the City of Oak Ridge to provide critical infrastructure to support DOE missions and also funds education and schools. Beyond the billions in economic gain, the report confirmed substantial community and educational benefits from DOE’s presence in Tennessee. DOE and its contractors gave over $2.4 million in charitable donations in 2017. They contributed more than $627,000 to education initiatives in East Tennessee. DOE facilities in Oak Ridge attracted over 50,000 visitors, a number poised to grow from heritage tourism due to the recently announced Manhattan Project National Historical Park and History Museum to commemorate Oak Ridge’s role in ending World War II. Oak Ridge is integral to our national security and nuclear nonproliferation efforts. It is home to leading scientists and researchers and nearly 2,300 patents and licenses, 127 of which were secured in 2017. State-of-the-art facilities enable these experts to conduct transformative science and technological research to tackle global dilemmas. These assets cement Tennessee’s stature in scientific leadership. Leading firms and experts in energy, nuclear technology, advanced manufacturing, computing and artificial intelligence are drawn to the region to partner with expertise found in Oak Ridge. Research on DOE’s economic impact in the state of Tennessee in FY2017 was conducted in part by a Booz Allen Hamilton economist and initiated by the East Tennessee Economic Council. The American Composites Manufacturers Association (ACMA), Arlington, Virginia, has announced the conference program for its inaugural Composites Recycling Conference, set for April 10-12, 2018, in Knoxville, Tennessee. The conference program features the technology and business developments in composites recycling presented by leading experts from U.S. and around the world. The conference program features panel discussions and presentations from notable companies, including Owens Corning, Ashland, Airbus and the Composite Recycling Technology Center. The program covers a range of topics and industry advancements in composites recycling, including the pyrolysis process capable of recovering glass and carbon fibers; recycling and reusing thermoplastic and thermoset carbon fiber reinforced polymers (CFRPs) in the aviation market; and state-of-the-art recycling technology. Industry experts and business leaders will share new and existing incentives for recycling and waste reduction that are reducing costs and making the business case for composites recycling. Additionally, the conference features preconference and postconference tours of leading institutes in the Knoxville area that focus on composites manufacturing and end-of-life recycling. Attendees will have the option to tour IACMI — The Composites Institute Lab at the University of Tennessee, Knoxville, Oak Ridge National Laboratory Manufacturing Demonstration Facility as well as Local Motors. These tours offer an opportunity to see how government funded laboratories are addressing their challenges, ACMA says, including developing a robust and scalable composite recycling methodology as well as how a local manufacturer is creating products from recycled carbon fiber. 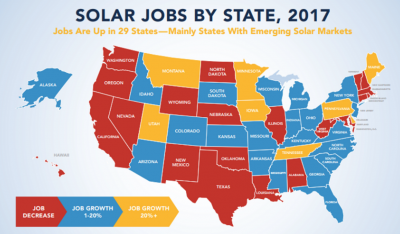 U.S. solar industry jobs increased in numerous states with emerging solar markets, according to the National Solar Jobs Census 2017, the eighth annual report on solar employment released by The Solar Foundation. Solar jobs increased in 29 states and the District of Columbia in 2017, including many states with emerging solar markets. States with significant job gains of 20 percent or higher include Tennessee, Utah, Montana, Minnesota, Iowa, Pennsylvania, Delaware, and Maine. Tennessee specifically reported a 24% year to year growth, increasing from 3,548 solar jobs in 2016 to 4,411 solar jobs in 2017. The Volunteer State now ranks #14 in the nation for solar jobs with a 2017 ratio of solar workers to overall workforce of 1 in every 668 people, according to the Solar Foundation’s State-by-State break down. The long-term trend shows significant jobs growth nationwide. The solar workforce increased by 168 percent in the past seven years, from about 93,000 jobs in 2010 to over 250,000 jobs in 2017. Demand-side sectors (installation, sales & distribution, and project development) make up almost 78 percent of overall solar industry employment, while manufacturing makes up 15 percent. The solar industry is more diverse than comparable industries, but more needs to be done to ensure it is representative of the greater U.S. population.